Whilst in Dumfries on a cycling trip I checked the Scotch Pie Club website to see if there were any recommended Scotch Pie available near to my route. 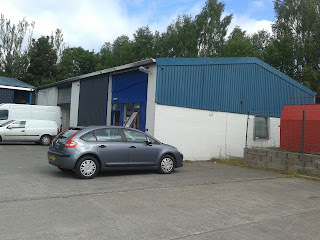 I found a company called The Little Bakery who had won Scotch Pie Club Awards Gold in 2014 for their Scotch Pie. The name 'The Little Bakery' sounded appealing, I was expecting a cute, traditional bakery shop. We were following National Cycle Route 7 and it was about a 2.5 mile detour off our route so it took a bit to convince my girlfriend it was worth it. 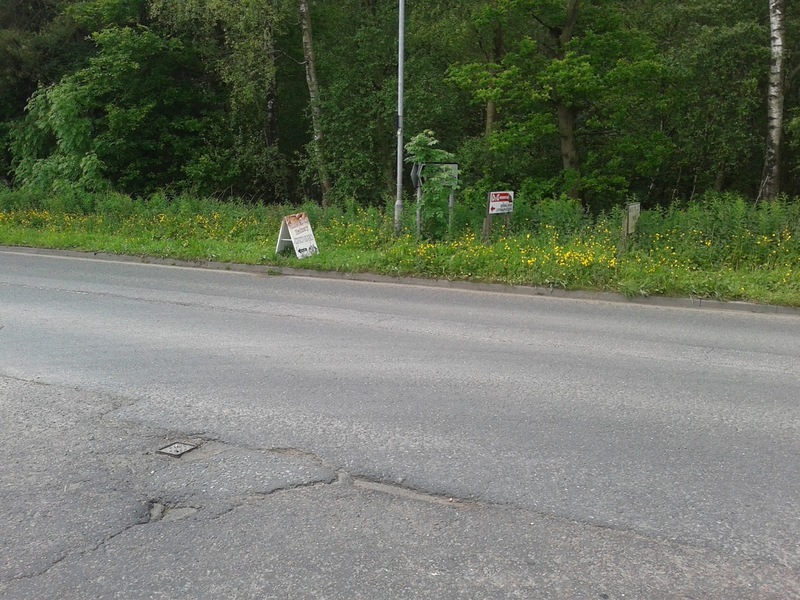 However, the excellent traffic free cycle routes across Dumfries really helped. Unfortunately my girlfriend didn't enjoy getting completely lost in a housing estate after it turned out that the address of "2 Downs Way" that I found on Google was pretty misleading. Because we had taken such a detour I refused to give up despite Anna starting to lose a bit of patience with my constanstly optimistic belief that it was 'just around the next corner'. Fortunately, after some time I spotted this sign hidden in the greenry. So it turned out the address should more accurately read Unit 2A Downs Way Industrial Estate, this was not at all what I was expecting. This was once of the least glamourous locations I have ever purchased a pie from. 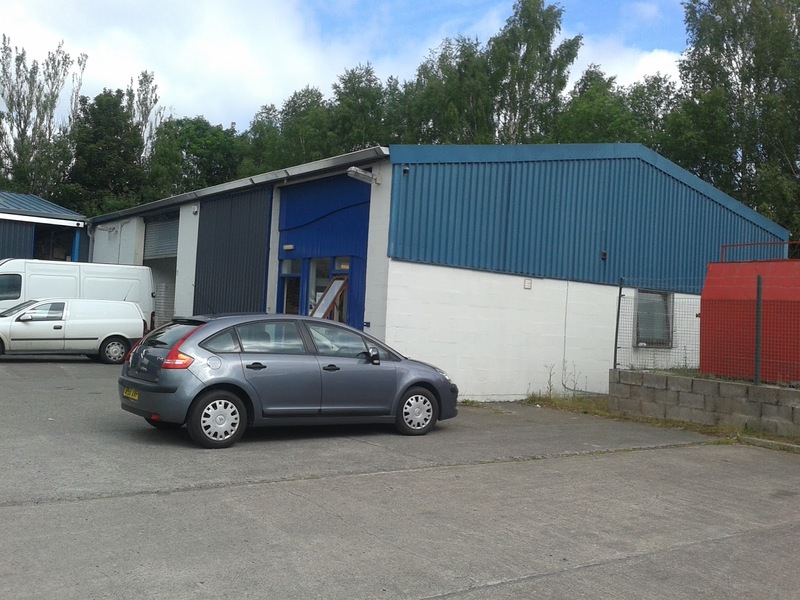 There was a little bakery built into the front of this warehouse with a blue facade. Once inside it was much nicer than I expected (given the location). It seemed like any high street bakery and was particularly appealing with many different pies available to eat hot or cold. 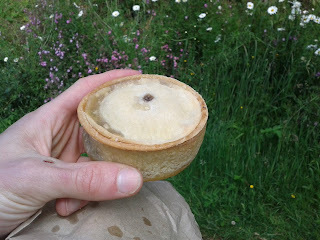 For £2.30 I grabbed a hot Scotch Pie and a Macaroni Pie to give me energy on my cycling trip. Judging by the amount of grease which had oozed out of the Macaroni pie, this was a good choice if looking for a high calorie content. 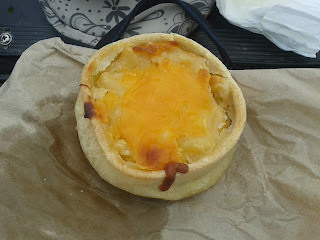 The Macaroni pie was as good as any I have had, it was cheesey and stodgy in pleasingly wrong amounts. Sadly it did lack a pastry lid meaning it doesn't meet our definition of a proper pie so I haven't given it a formal score. The Scotch pie was okay, but I actually found it a little disappointing. I don't know if I was just unlucky but it wasn't well filled. The flavour of the minced beef filling was a little bit bland for me. However, the texture was good, with some crunch to the pastry and a moist filling. At £1.20 it wasn't the cheapest Scotch pie (espeically as I bought it direct from where they make them) so I don't think I would be venturing into an industrial estate to have another. I think that the reason they are based in the Industrial Estate is that they supply pies wholesale to local shops so if I chanced upon another I might get one again. See how this pie fares against all the other Scotch Pies we have eaten in our list of the best Scotch Pies. Interestingly The Little Bakery had the best Scottish Football League football pie at the Scotch Pie Club Awards 2016 at Queen of the South for their Scotch pie, congratulations to them, perhaps we were just unlucky with the one we had. continue reading "Little Pie Review"
If you have been reading Pierate recently you will realise that our favourite pies of 2015 were those made by "MyPie", a business set up by entreprenuer Chris Brumby who we first met back in 2014. In 2015 he started selling his excellent pies in London food markets from a refurbished Bedford van. The Steak & Ale has gone in at number 3 in our all time pie rankings and Chris was good enough to bring joy to our recent Pie Party by doing the catering! We had so many good comments we know it is not just the Pierateers that have fallen in love with these pies! We do like to think that pies are quintessentially British and that we do the best pies. Hence it is perhaps a bit controversial that Chris is Austrialian and bringing a bit of Aussie pie magic to the streets of London. The Aussies are in fact more obsessed with pie that us Brits. Whilst we have an abundance of hot Cornish pasty outlets and Greggs (who sell hardly any pies) the Australians have a number of shops specialising in hot pies. We found this out first hand in our special investigation when Pierateer TJP was dispatched to warmer climes. Having tasted how good Chris' pies are I can now understand The Kinks song 'Australia'. It has the line 'everyone walks around with a perpetual smile across their face' which is not surprising when the pies are this good. 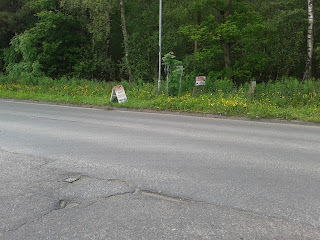 It is a bit of a treasure hunt tracking down Chris and his Bedford van. Wandering around the South Bank it took me a while to find him, you don't get the same problem with a pie shop, once you know where it is it tends to stay in the same place (if you ignore the effects of plate tectonics). But MyPie is transient and somewhat mysterious. I am now quite familiar with MyPie but I don't really know where I will find the MyPie van each day of the week. It is also uncertain what pies will be served. Then, once you have found him, before you know it he is gone again, such a tease. MyPie is much like the transient and mysterious nature of the pie itself. You never quite know what is going to be contained within the golden pastry case and if you are anything like me, once you do find out, it doesn't hang about for long. I think this all adds to the suspense and theater of the pie eating experience. 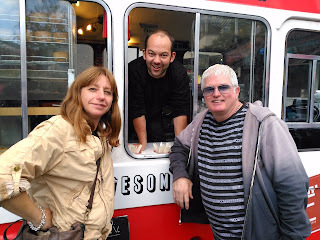 When I did track Chris down on London's South Bank, I was surprised to find what seemed like a London pie makers meeting, Paul and Nicky from Piebury Corner were busy chatting to Chris. Paul seemed quite taken with MyPie, which is a massive complement when they have been so successful with their own pie business. I grabbed some pies from the van to review also got some more when Chris came to our pie party. The flavours were Beef & Horseradish; Venison, Chili & Cheese; Mince, Bacon & Cheese and Sweet Potato & Goat's Cheese. I delegated the Sweet Potato & Goat's Cheese review to our vegetarian reviewer ARL because she is a bonafide consumer of exclusively vegetarian food. Overall these pies were consistently outstanding, the Venison Chili & Cheese worked especially well for me. As usual the price is a pie meal for £6.50 or the two pies for £7. These prices are competitive with premium supermarket pies which is incredible considering they are homemade in small batches. All of the pies had the same fantastic pastry we enjoyed with the Steak & Ale and the Chicken, Ham & Tarragon where it was crisp on the outside and softer in the middle. They look terrific and very close to my vision of the quintessential, ultimate pie. Firstly the Venison, Chili & Cheese. The pie was packed with chunks of great tasting meat which had a bit more flavour than your average meat pie. The chunks of meat were soft and satisfying to get your teeth into. The small amount of cheese at the base of the pie also added an interesting texture. It was a little like mozzarella in texture and didn't have a strong flavour. This kind of cheese in a pie seems to be a bit of an Aussie trait with the now defunct Jumbucks using cheese in a similar way. It is less common in British pies where Stilton seems to be the cheese of choice. The pie was full of rich gravy which had the perfect consistency in that it didn't just ooze out when the pie was cut open. It was perfectly seasoned but what made the flavour stand out was the heat from the chili. There wasn't too much of a kick but it was enough to give a good kicking to the com-pie-tition and make this pie enter into our top 10 all of all time in the number 4 spot! Being a greedy pie gobbler, I had the Beef & Horseradish at the same time. Whilst it was also an excellent pie, in many ways similar to the Vension, it was slightly overshadowed in part because of it was a bit too runny. Yes, the chunks of meat were large and satisfying but I only noticed a small amount of veg in the pie. It had a slight sweetness, perhaps from the addition of vegetables. It tasted much like a classic beef casserole. The horseradish was only very subtle which is a good or bad thing depending on your opinion of this particular root. This did mean that it didn't have the same stand out flavour of the venison although it did taste nice. Now onto the Mince, Bacon & Cheese. This pie was somewhat different but no less special that the others. It is the closest I have ever come to eating a cheese burger in a pie. If that sounds appealing then you should really try this pie because it really nailed it. It had a full, smokey flavour, perhaps from the use of bacon. 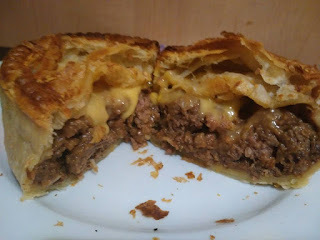 Unlike an actual cheese burger, the meat could be very moist which was the most beautiful thing about this pie; whilst it was like a cheese burger it was even better due to being fully encased in pastry. There was no liquid gravy as such but it didn't need it. There was a layer of classic burger cheese at the top which added variety to the flavour. In some ways it captured all the aspects that I love about Scotch pies. Despite having no big meaty chunks, it felt like the texture wasn't lacking, there was plenty to get your teeth into. Another standout effort from MyPie although scores slightly less than the venison as I think I would more often choose a pie with big chunks of meat. Also, the pastry was slightly too thick in places. Onto the Sweet Potato & Goat's Cheese vegetarian pie review by Pierateer ARL. I didn’t know what flavour this was so it was a surprise. Or a sup-pies. Given the taste I guess that it was sweet potato, pea and some sort of cheese or cream. It was really tasty regardless of what flavour it was. The sauce was thick and creamy and the unidentified orange vegetable was soft and tender. The pastry was utterly perfect. It was crisp and buttery and I don’t know what else to say- it was so good. Generally, the pie lacked a depth of flavour. It was sweet (but nicely so!) and creamy, but that was all I really got from it. continue reading "Wizard of Oz"
It is the time of year when the weather makes a pie seem even more appealing than normal. When your hands start to get cold what could be better than a warm pie to hold? As the snow has been falling I decided to craft myself a 'snow pie' whilst I was waiting for my real pie to cook in the oven. If the cold weather has inspired you to grab a pie then do let us know with the hashtag #coldhandswarmpies. continue reading "Cold hands? Warm pies!" The Kandy Bar Bakery from Saltcoats have done it again! They have been crowed World Scotch Pie Champion for the second time, having previously taken the crown in 2014 when we were part of the Scotch Pie Club judging team. They retake the title from Murrays Bakers in Perth who were the 2015 winners. Given that the second placed pie was Beth Browning's Bakery in Kilwinning, it really is about time the Pierateers made a trip to Ayrshire. The vegetarian and fish savoury categories have been dropped this year in favour of the classic Haggis savoury which we are pleased to say was won by a haggis pie, as were all the categories where pies were against other products (which we are happy about at Pierate). Brownings the Bakers again won in the steak pie category with their famous 'Killie Pie' which we reviewed back in 2014. The full list of winners in below. 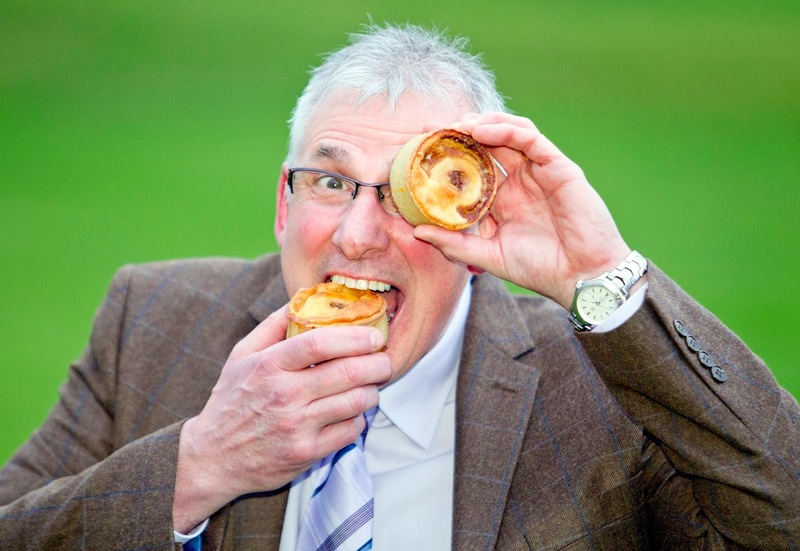 If you want to find out more about Scotch Pies, see our article on 'What Makes the Best Scotch Pie?'. continue reading "Scotch Pie Club Awards 2016"
Goal-Den Football Pies at Millwall? When it comes to football, there can't be a more famous cup competition than the FA Cup. The history, the legend... but also plenty of cupsets! So with the infamous third round ties about to get underway, we rate the pie we had in Round 2 as Wycombe caused a shock at The Den against higher ranked Millwall with a stoppage-time winner! Would the pie rate highly or upset the fans in the stands? It was a shame this therefore wasn't a new flavour to add to the Pieremiership table, however we were pleased that after a few bites it was clear that the pie was a lot better quality than the version we had at the Sixfields Stadium. Once again the pies certainly looked good - golden brown in colour with a nice, crisp flaky pastry on top, but this time we weren't so disappointed with the filling. Sure, we wouldn't go as far as saying it would challenge at the top of the Pieremiership, but it was good to see that they were selling a much improved pie at the Den than they had at Northampton. It really highlighted to us what difference it makes when a pie is more thoroughly cooked and not dried out at a football ground, as I think the need for speed of service can often hinder the perfect pie being sold in football grounds up and down the country. If anything, the pie at Millwall was probably a little too cooked, which made the pastry rather crunchy and flakes immediately fell off upon biting into it. However the extra baking meant the pie held together quite well, as nothing's worse than a football pie which collapses in on itself and falls apart, getting gravy all down your football shirt! Sure it still did break up a bit, but nowhere near as badly as some football pies we've had! It tasted decent too, due to the quite well filled capacity, with a decent amount of steak and soft, tender meaty chunks. There was still quite a lot of gravy though to bulk it out, which was a reasonably sour taste from the ale but a reasonable flavour. At £3.40 this is on the more expensive end for a mass produced football pie, which reduces the cheapness score but certainly after some of the football pies we've eaten recently, it made a change to have a football pie I would be happy to eat again! Condition – 4 out of 7 - Looked pretty appealing, nice and tall. Particularly crisp, golden lid. Held together quite well. Colour – 4 out of 7 – Quite golden on top but sides paler, a bit matt rather than glossy. Cheapness – 3 out of 7 – £3.40 is quite a bit above average for a football league pie - especially one that's mass produced - and despite being decent meat content for a football pie, in the grand scheme of things this still didn’t feel like great value. Capacity – 4.5 out of 7 – Quite tall and big capacity but still a reasonable airgap at the top. Whilst it looked like it would be satisfying, overall there was an air of disappointment. I would prefer a smaller pie without the airgap. Still, above average for a football pie! Chewiness – 4.5 out of 7 – Pastry was a lot crisper and more enjoyable than before. Not much chewiness to the meat. Content – 4.50 out of 7 - It was nice that the ale was noticeable but was a little too sour. The meat that was there was nice enough but still a bit too much of a gravy pie top marks! 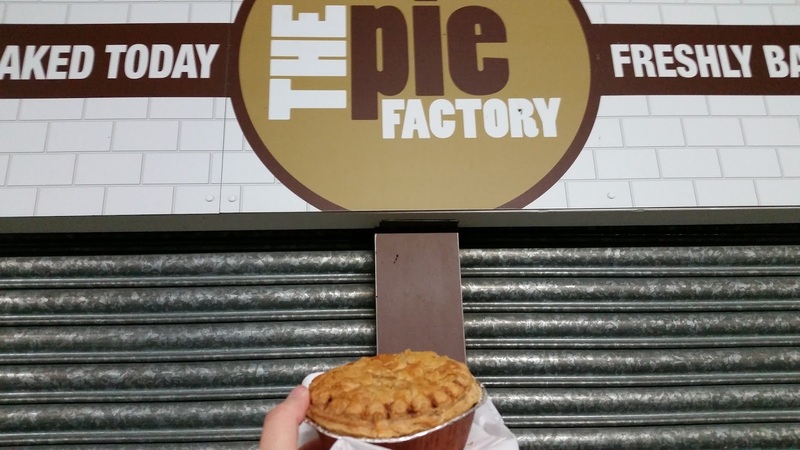 Consistency – 4.50 out of 7 – Much improved on the Pie Factory pie previously eaten. A lot more meat and far better pastry, more cooked. 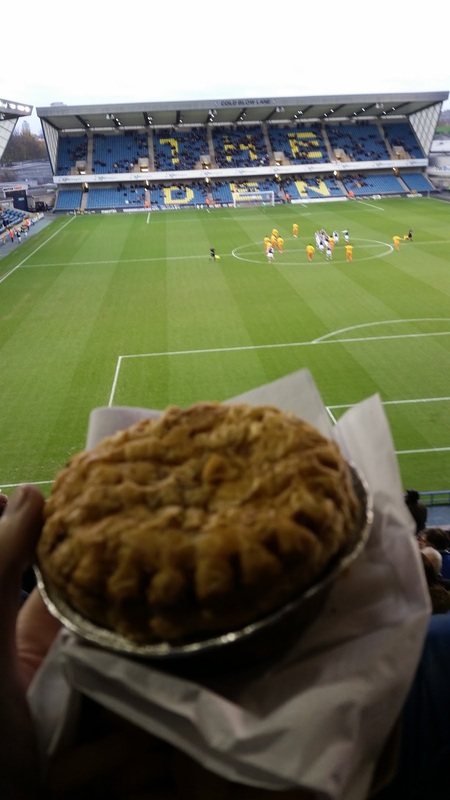 continue reading "Goal-Den Football Pies at Millwall?"